VFW Post 2591 Announces Winners! 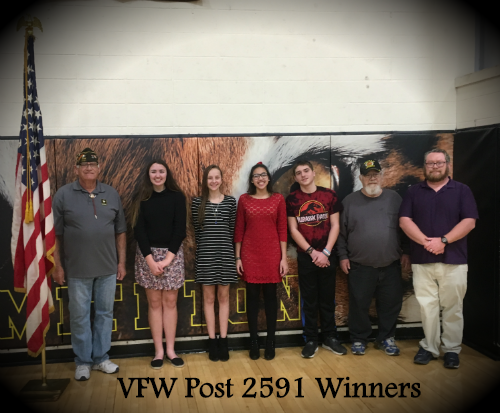 VFW Post 2591 announced the results of the annual "Voice of Democracy" and " Patriot Pen" student winners and Teacher of the Year award. Several students and a Smithton teacher were awarded these honors. Leighney Trotter won first place in the "Voice of Democracy" competition. For the "Patriot Pen", Smithton Junior High dominated the competition with Breanna Sims taking first place, Anya Chernioglo taking second, and Dwight Huddleston taking third. Our very own teacher, Aaron Schroeder won Post 2591 and District Teacher of the Year. Congratulations Tigers!!!!!! !